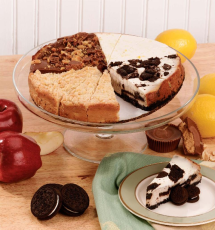 This sampler brings together 4 of our favorite flavors all in one cheesecake. With a total of 16 slices, this delight includes 4 slices of each of the following flavors making this unlike anything else you've ever tasted. Peanut Butter Cup, Lemon Biscotti, Cookies and Cream, Caramel Apple.